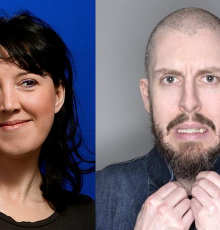 Join us for another spectacular Comedy Night with Eleanor Tiernan's long awaited return to Brussels. Together with her, and for the first time in our city, award winning comedian Carl Donnelly. Eleanor Tiernan is an Irish comedian well-known among Irish audiences for her live stand up performances and her work in TV, theatre and on radio. She was featured on Stewart Lee’s Alternative Comedy Experienceon Comedy Central and has played Latitude, Glastonbury, Montreal Just For Laughs and all of the top Irish comedy festivals. Nominated for best comedy show in the 2013 Foster's Edimburgh Comedy Awards for Now that's what I Carl Donnelly Vol 5. Carl started his career scooping awards, taking the 2006 Laughing Horse new act competition, the 2007 Chortle Award for best newcomer and the 2007 Leicester Mercury Comedian of the Year. He appeared on a selection of TV shows (Mock The Week, Russell Howard’s Good News etc) and travelled the world having performed at the Just For Laughs Festival in Montreal, The Melbourne International Comedy Festival, The New Zealand Comedy Festival and pretty much every other comedy festival there is.